Teaching a child to draw the human figure is an activity that acts as a building block for learning the movement and shapes included in the human form. Focusing on the different parts and their basic shapes allows a child to build the human figure and identify their ability to break down large tasks into more achievable goals. Follow some basic steps and allow children to complete a project that showcases their creative side. Practice various shapes with the child using a standard HB pencil and heavy grade drawing paper. Have him practice circles, ovals rectangles and squares. Explain that all these shapes are used when drawing the human figure. 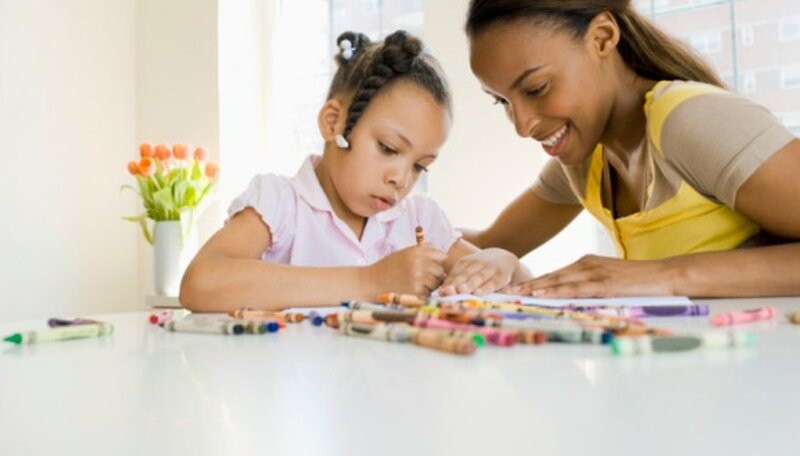 Sit beside the child with your own pad of paper and pencil and allow the child to mimic what you do as you draw. Start with the head. Point out that the human head is an oval. Assist him drawing the oval if necessary. Continue to draw the basic shapes for the rest of the body one at a time as the child copies what you do. Use a rectangle for the neck and a long oval for the body. Use two ovals for each leg and arm; one for the top section of the limb and one for the bottom. Point out that arranging the ovals in different positions will cause the body to change its position. Finish the basic form by drawing triangles for hands and feet and small ovals for fingers and toes. Draw small circles where all the joints would be on the human figure. Have the child outline the perimeter of the figure with a graphite pencil. Tell him to erase all the lines inside the figure that initially made the individual shapes. He will now have a basic human figure. Elizabeth Vander Heide has been writing since 2003. She owns and operates a successful mural and hand-painted furniture business. In addition to art and decorative painting, she is an experienced hairstylist and makeup artist with a wealth of knowledge of the beauty industry. Vander Heide writes decorative painting instructions and seminar guides for professional tole painters. She studied at Cappa School of Hairstyling.